Base of Operations: Hell, but mobile across the world to get to her victims. 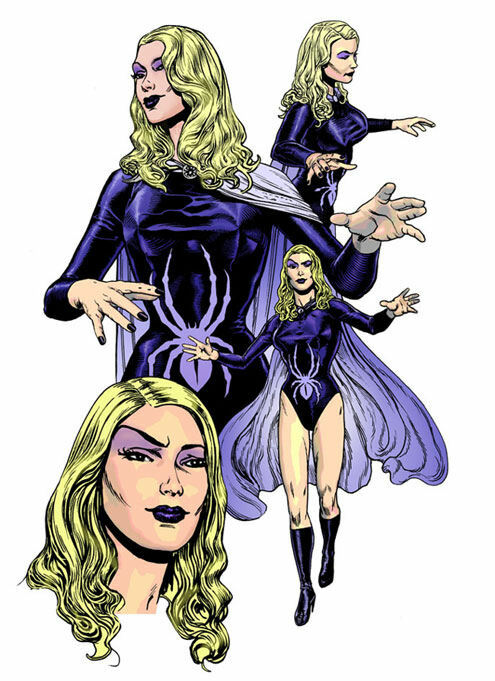 Powers/Abilities: Able to kill with a touch, leaving the mark of a Black Widow spider on her victims. Being undead, she is immune to most mortal weapons. Able to transport herself in and out of Hell to kill evil-doers. Satan says she is immortal, but that might not be the case - he is, after all, known for being a lier. 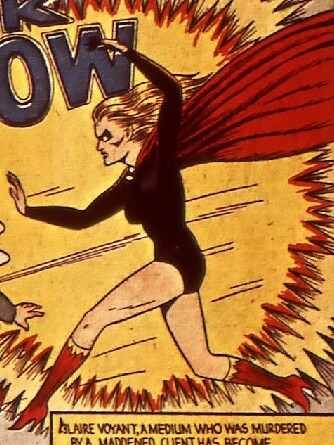 History: "Introducing the strangest, most terrifying character in action picture magazines - the Black Widow. You've heard of the black widow spider - that evil creature whose bite spells doom. Now start the adventures of another black widow - a human tool of Satan whose very touch means death." (Mystic Comics I #4, 5, 7; U.S.A. Comics #5, All-Select Comics #1, ga) During a seance for the Wagler family (mother, daughter and son James, trying to contact the father), professional medium Claire Voyant was briefly possessed by another personality, changing in appearance and warning them of a terrible doom that would soon overtake them. Terrified, Mother Wagler insisted on leaving, and Claire, now back to being herself, cursed them for their insults as they departed, then wondered what made her do such a thing. Racing away in their car, the Waglers were blown off the road; Mother Wagler died immediately, and the daughter died soon after in her brother's arms. Believing it was Claire's curse which caused all this, James returned to the medium's home, and gunned her down. Satan appeared, causing James to flee, gathered up Claire's corpse, and took her down to Hell. There he lay her on an altar, and revived her as The Black Widow, a beautiful but terrifying version of herself with skulls for eyes - the very being who had possessed Claire during the seance! Then he sent her back to Earth to avenge her own death. She appeared before a grieving James, the with a single touch she caused him to die swiftly and painfully. Returning to her master, Satan charged her with bringing evil souls to him, since he was not content with waiting for them to die a natural death and perhaps repent their sins. "On the upper world are mortal creatures whose hearts are blackened with wickedness and corruption. You, the Black Widow, will bring their souls to me!" (Mystic Comics #5) The Black Widow targeted Garvey Lang, a notorious crime boss. She approached him during a costumed ball, danced with him, and then, when he asked her for a kiss, removed her mask to reveal her undead visage, just before she killed him with a burning touch to the head. (Mystic Comics #7) The Black Widow slew two munitions magnates who were selling arms to both sides in World War II. (U.S.A Comics #5) The Black Widow took on Murder, Unlimited. (All-Select Comics #1) No synopses available. (Marvels #1) The Black Widow was among a number of superhumans who joined an attack on a Nazi stronghold in Germany, dropping in from the air. (Presumably she was happy to work with the heroes in attacking the Nazis, since she would find many souls to damn among the Axis forces). (The Twelve #1-12) Black Widow took part in the Allied invasion of occupied Europe, but alongside other heroes was captured by the Germans and placed in suspended animation. She has recently been revived. Comments: Created by George Kapitan and Harry Sahle. 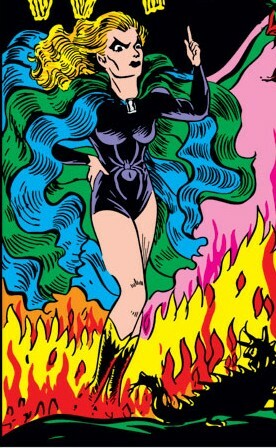 During the Black Widow's origins, it is clear that Satan is behind virtually everything - when Claire transforms during the seance, it is into her later Black Widow appearance, and Satan is seen standing behind her; when she curses the Waglers, the reader can see Satan whispering in her ear and she curses them "by Satan"); when they crash, Satan's face can be seen blowing them off the road; when James Wagler decides to come back for revenge, Satan can be seen telling him to do so; and so on. Black Widow is due to be revived soon as part of the new Marvel mini-series "The Twelve" by J. Michael Straczynski. Thanks to Jess Nevins for allowing me to use information from his excellent Golden Age Heroes Directory and his Guide to Golden Age Marvel Characters. Thanks also to Richard Boucher & Darrin Wiltshire @ PR-Publications for permission to use information from their equally brilliant collection of Golden Age Sites, PR Publications. Their knowledge of Golden Age characters far outstrips my own. Thanks also to Copper for the use of the Micro Hero used on this page.